The WBW water-resistant commercial scale features IP66-rated washdown housing and a large, easy-to-clean stainless steel weighing pan for significant protection against water and dust. The IP66 rated housing means that the WBW is fully dust-proof and can withstand powerful jets of water from a nozzle or funnel. Checkweighing is simple with WBW's colour indicators to warn if a sample is under or over preset limits. Power is supplied by an AC adapter and rechargeable battery, whilst the auto power-off feature conserves battery life. Designed for commercial retail applications, the WBW-M is EC type / OIML, NMI and NRCS approved for selling goods by weight. WBW scales feature IP66-rated plastic plastic housing for significant protection against water and dust ingress. Combined with an easy-to-clean stainless steel weighing pan, the WBW can be easily washed down after preparing food products in order to maintain food health and hygiene standards. The WBW washdown scale is portable an compact in size, easily fitting on a bench top surface. 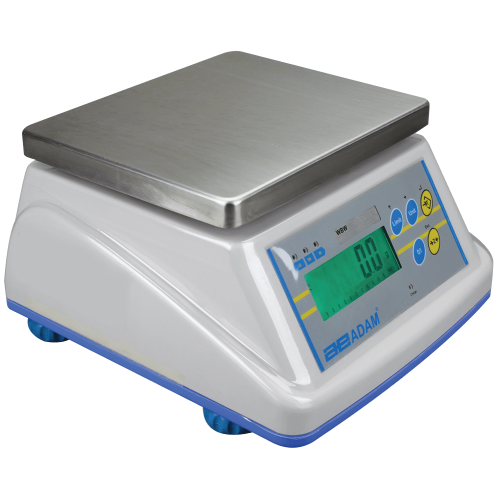 Constructed from durable materials which offer advanced protection against water, dust and other residue, this scale is particularly useful in food processing and packaging tasks. The WBW features integrated checkweighing capabilities to accurately check the weight of fruit and vegetables on market stalls before packing. WBW-M models feature all the necessary NMI certifications for buying and selling food products by weight.